Although it is used today by nearly every team in the National Football League, the popular shotgun formation is nothing new. 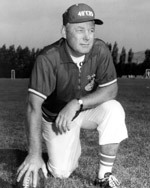 The San Francisco 49ers, under head coach Red Hickey, unveiled a version of the now-popular formation in 1960. However, even Hickey’s shotgun was really just a new version of an old formation. Veteran coaches likened it to Pop Warner’s Double Wing B-formation that was introduced at Stanford some thirty years earlier, or the short punt formation that had been used by numerous teams through the years. 49ers coach Red Hickey unleashed the shotgun formation to combat a fierce Baltimore defense in 1960. Regardless of its origins, Hickey’s version brought excitement and lopsided wins to a then-otherwise lackluster 49ers team. San Francisco first used the shotgun on November 27, 1960 in a game against the Baltimore Colts. Hickey knew the Colts had a terrific pass rush, so in preparing for the game he had his quarterbacks practice taking snaps seven yards deep rather than from under center. This, he reasoned, would not only give his quarterbacks more time to spot receivers, but also cause the Colts to rethink their defensive alignment. He was right on both accounts. The result was a stunning 30-22 upset of the heavily-favored Colts. The 49ers’ attack was actually orchestrated by third-string quarterback Bob Waters who was filling in for backup John Brodie who replaced an injured Y.A. Tittle. Brodie went down with an injury early in the game after a ferocious hit by Colts defensive tackle Big Daddy Lipscomb. What really surprised the Colts, however, was the 49ers’ ability to run from the shotgun. San Francisco went on to win three of their final four games using the formation with Brodie emerging as the starter. He became known as "the man who pulled the trigger of the shotgun." In 1961, the 49ers added rookie tailback/quarterback Bill Kilmer to their offensive arsenal. Hickey used Kilmer, Brodie, and Waters on an alternating basis and sent in plays with each new man. The 49ers, with their three-quarterback shotgun offense, got off to a quick 4-1 start that included 49-0 and 35-0 wins over the Detroit Lions and the Los Angeles Rams. However, in a game against the Chicago Bears on October 22, the shotgun misfired. Bears linebacker Bill George found a weakness. Instead of lining up in his usual linebacker spot, George moved up to the line of scrimmage. With his added presence, the Bears were able to penetrate by attacking the center and getting through to the quarterback. After harassing 49er quarterbacks all afternoon, the Bears clobbered San Francisco 31-0. Soon after that game, Hickey figured the shotgun was dead and retired the formation. However, several years later, the formation returned when Tom Landry and the Dallas Cowboys added a refined version to their offensive strategy.